Saracens powered clear after the break to beat Wasps 31-13 and book a Tyrrells Premier 15s final against Harlequins. Saracens took the lead through a converted Jodie Rettie try after 15 minutes and five minutes later Lotte Clapp crossed for an unconverted score. Two Lizzie Goulden penalties for Wasps brought it back to 12-6 at half-time. But Sarries pulled clear through Poppy Cleall, Hannah Botterman and Rosie Galligan tries, with Louise Dodd's late try little consolation for Wasps. Zoe Harrison landed three conversions for defending champions Saracens. 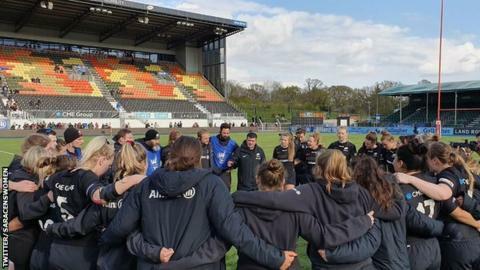 The final for the Premier 15s - the top tier of domestic women's rugby union - will take place at Northampton Saints' Franklin's Gardens ground on Saturday, 27 April (kick-off 17:45 BST).